You’ve signed the papers, acquired the keys and the home is finally yours! 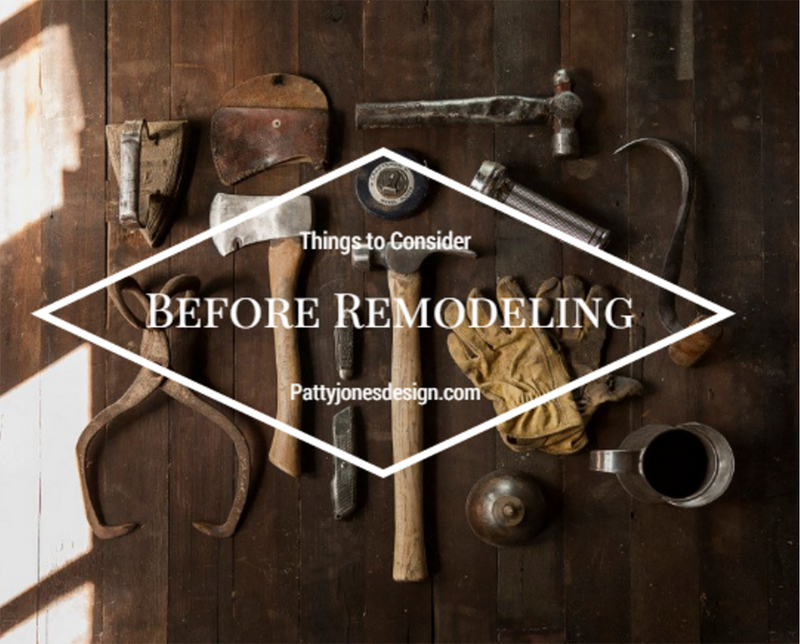 However, there are some changes needed to make the house a little more “you.” Take the time to consider these topics before you remodel to ensure the best experience. Having a team will help your remodel move forward as efficiently and smoothly as possible. Your team will look different depending on what the remodel entails. Are you removing a wall? You’ll likely want to contact an architect. An interior designer helps to ensure that the space flows well and supports day to day living activities. Any wiring alterations would require an electrician. Of course, you’ll also need the person who is going to do the work, the contractor. Many contractors can provide referrals for people they have worked with in the past, but you should do your own research as well. Sometimes it can be hard to pinpoint your personal style and exactly what you would like out of a redesign. Start thinking about how you would like to feel in your home and most importantly what you love. The problem with trends is that they can come and go very quickly leaving you wanting more just a few years down the line. Think of what speaks to you for more long term happiness. What do you want people to think/feel when they walk in the door? Do you want a focus on comfort? Think about elements you do not want to see in your home, this may help you narrow down what you do want to see. Don’t forget to consider the construction of your home. The design should work with and complement the construction of your home, not compete. If you are having trouble getting started, don’t worry, an experienced interior designer will get you started and guide you through the process. What will help make your life more functional? Rather than thinking about the styles that are currently on trend and what you have seen in stores, think about what will help make your life more functional. A lovely white settee may contribute to the lavish ambiance you desire, but is probably not optimal piece of furniture for a busy household with kids and pets. Also, try to identify the things that are bothering you most about the way your home currently functions. If it feels like you are running out of space, could the issue be resolved by connecting with a professional organizer and eliminating some clutter or is additional work and storage space needed? Feel like your living room has an awkward uncomfortable layout? Connect with an interior designer to see if a simple rearrangement of your current furniture or careful selection of new pieces can remedy the problem. Sometimes handy homeowners may get a whim to build that deck or sun room they have been coveting without going through the proper channels. This can be a big hang up when you are eager to get your new home redesign underway, not to mention, a lot more money. Before beginning any new changes or construction, make sure all structures are properly permitted to be able to move things along at the optimal pace. You can have a beautiful home on any budget, but start thinking about where your limitations may be. Meet with a professional who will be able to give you a better picture of what the work may cost. Kitchen and bathroom remodels tend to be the most costly. A kitchen remodel can easily land in the $20,000-$30,000 range or more. It’s tempting to make changes in the process of a remodel, but this can be costly and add to the overall length of the project. If you have a tight budget, those additions may mean you have to make cuts somewhere else. Get your priorities straight before you begin. Living in a home while it is getting remodeled may seem doable before the project begins, but it gets old fast. Consider how long the project is going to take and what accommodations you need to make before starting. Also think about whether you want the project to be done as a whole or to break it into smaller projects for less impact. The process of a remodel can be daunting, but in the end the result will be a beautiful home that makes you proud. Don’t get scared away from creating your dream home, use these steps to prepare to make the process more stress-free and successful. And have fun! !